Instagram top posts have existed for quite some time now, but still, it’s a feature that holds a lot of mystery, because there are few people who know what it is, how it works, its benefits, and how to get featured there. 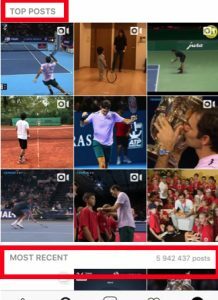 What are top posts on Instagram? Every hashtag and location has its own section of top posts. This is a section of 9 posts at the top of the respective hashtag or location that has received the most engagement. When you scroll through a location or hashtag, you will see two sections. At the very top, you will see three by three images at the with the text “Top Posts”. 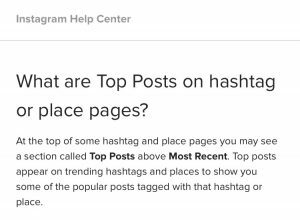 If you’re using hashtags or locations on Instagram to boost your exposure, Top Posts are like regular hashtags and locations on steroids because it brings multiple folds the results. When you use a hashtag, for example, your post will be placed at the top of the “regular feed” – the “Most recent” feed, as seen above, located right below Top Posts. First, the post isn’t presented at the very top, which makes it a bit trickier to find, but more importantly, your post will quickly get bumped down as other people are sharing posts with that hashtag. This is especially true if you’re using the most crowded hashtags on Instagram. If you do, your post will be visible for no longer than a few seconds. And how much exposure will you get during those few seconds? Getting your posts displayed on the top post section on a hashtag or location will lead to a ton of exposure and a bunch of new followers. 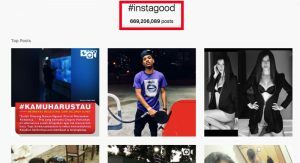 Working to get featured on Top Posts should be a part of your Instagram strategy because if featured there, it will boost your page quite significantly. And the more crowded location or hashtag you get featured on, the better the results you’ll get. Because of the visibility and exposure you get, it will help you grow your audience, help you engage with them, grow your followers, increase your likes, and possibly even convert them to customers. Therefore, you should take the approaches that help you increase the chances of getting featured on the Top Posts section. The posts featured on Top Posts are not selected by man, nor picked from a default group of accounts. 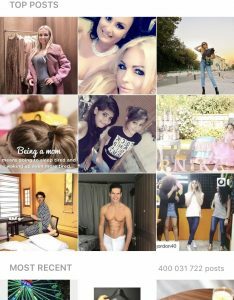 Instagram uses an algorithm that ranks and decides which accounts with which posts using a particular hashtag/location should be featured on top Posts. Obviously, the majority of hashtags and locations have more than 9 posts, so an algorithm is needed to filter out all the noise and only present the best. Take the hashtag “happy”, for example. It has over 400 million posts! It’s important that you differentiate the Search and Explore page from Top Posts because the Explore page uses an algorithm that presents content that it thinks you will find appealing, based on the people you follow, your previous interactions, and several other factors. While Instagram hasn’t told us how the algorithm works in detail, what tends to have the impact on whether you get featured on Top Posts or not is engagement and growth of a post. In other words, what the algorithm does is look at how much likes and comments you receive, and how much that number has grown recently. Many people claim that getting featured on Top Posts is about getting engagement fast, and I completely agree with that. I’ve been featured on Top Posts too many times to count, and these haven’t just been hashtags with a few posts in them. The hashtags and locations have actually been quite crowded and competitive, and quick engagement really seems to have a huge impact on whether you will get featured or not. This means that an account with a lot of engagement has a significantly larger chance of getting to Top Posts than a small account. Now, does this mean that it’s impossible for you to end up on Top Posts if you have a small account? No, it just means that you need to take different approaches. Now that you know all of this, it’s time to put it into practice and start working towards being featured on Top Posts. Getting featured on top posts is not just a game of luck. In fact, you can actually increase your chances of getting featured there with a few tricks. For smaller pages, getting your post featured at the top of a crowded hashtag or location is virtually impossible. A crowded hashtag is a hashtag that has a ton of posts shared, and new posts being shared every second with it. Crowded hashtags normally have over a million posts, and unless you have a large account, these are not hashtags you should target because really, you’ll waste your efforts. Yes, you will get considerably more exposure and followers by getting featured at a crowded hashtag simply because there are more people using and visiting it, however, it’s better to aim for the less crowded hashtags and have a chance at getting on top posts instead of trying hopelessly to get featured on a popular hashtag. Because unless you have a large and engaged audience, it’s most likely not going to happen. The trending posts are not always from the biggest accounts. Posts from accounts with fewer followers can rank higher than an account with more followers. Instagram puts more emphasis on the engagement the post receives rather than just the number of followers you have. Really, you can just buy a bunch of followers and receive one like per post but still be featured on Top Posts, but how great would it be if it worked like that? While you don’t have to have the biggest account to win the top spot, for hashtags with a higher number of results you are more likely to win a trending spot if your account is larger. I have had my account featured on the top posts of a highly crowded hashtag even though that particular account was small compared to the others it was competing with, but it doesn’t happen all that often. If you have few followers compared to your competitors, you’ll be better off targeting less competitive hashtags. The reason being is that large accounts generally receive more exposure than small accounts, and it is difficult for a small account to reach the levels of engagement that the competitors have. The larger the hashtag, the more quickly the trending posts are refreshed. For highly competitive hashtags, your post is probably not going to stay there for more than 24-hours. However, for smaller tags, you may be able to stay there for a few days. Again, this depends on the competition and how many people are trying to outrank you. Note that you won’t see low-quality content featured on Top Posts. To get featured there, you cannot start in the wrong end by trying to increase your engagement if your content is low-quality. Begin by finetuning and improving your content and you’ll already be well on your way. This also goes for the caption. Create an attention-grabbing and appealing caption to attract more people to your post. Since engagement plays such a vital role, do everything you can to engage your audience. Ask questions, start a debate, ask people to tag their friends, or even ask them to like your post. If you want to use different approaches, you can even create a contest where people have to tag X number of friends in your post, because that way, you’ll boost your engagement through the roof.